A TWO-MONTH-OLD baby miraculously survived a fall on Sunday when his mother tripped and fell causing him to be thrown from her arms. Up to yesterday Revolino John-Williams remained warded in a stable condition at the San Fernando General Hospital. Apart from a fractured left leg, relatives said Revolino is cooing and smiling with hospital staff. "God is good. He watches over the children. The baby has no internal injuries or anything. All he has is a fractured leg. He is young, so he will heal well. Revolino is recovering well," said grandfather Errol Philbert, 64. 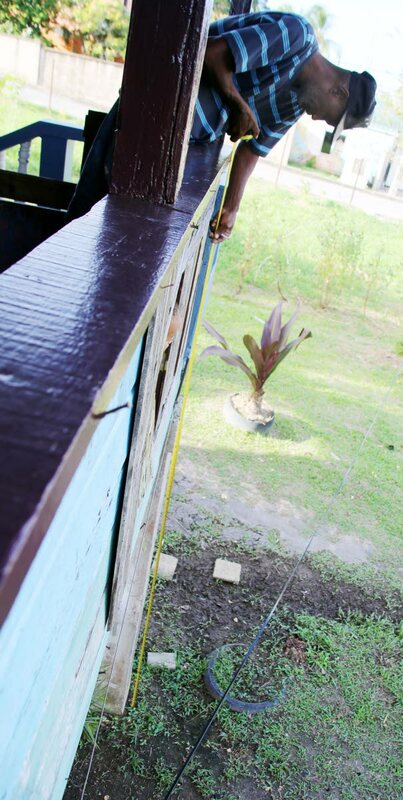 The incident happened on Sunday afternoon at the family’s home at Warden Road, Point Fortin. Shada Bermudez, 25, was carrying the baby in her arms from downstairs to upstairs on Sunday afternoon when she stumbled over a board barrier in the gallery. She fell to the ground and the baby pitched over a bannister and landed on the ground. Frantic, the mother of four, ran downstairs and picked up the child. He was taken to the Point Fortin Area Hospital and later transferred to SFGH where he remains warded. "She is really shaken up by the incident. I too have not been sleeping well. Her other boys were playing in the road when it happened. Since it happened, she spent most of the time in the hospital. The staff are taking good care of him," Bermudez’s father said. Philbert said he was not at the house when the incident happened. Revolino is the last of four children to Bermudez and Alfredo John-Williams, who lives in Cedros. Philbert said about a day or two he nailed an additional board to the barrier in the gallery to prevent Bermudez’s second-to-last-son, Ronaldhino, from going outside. Bermudez’s mother Jojo said: "He is getting big and climbing all over. He even climbing on the gas tank and we must protect him. God really protected Revolino. Thank God he is doing fine and only has a fractured leg. He is all smiles and everything." At the hospital bed, Bermudez said contrary to other media reports her son is not fighting for his life. "All he has is a fractured left leg," she said and declined to comment further on the issue. The matter is being investigated as an accident. Reply to "Baby survives 7-foot fall"